Stage 1 of fire engineering body for the all-terrain vehicles is now complete. Angloco are the UK’s longest established builder of fire fighting vehicles and a major supplier of fire and rescue equipment. Celebrating their 50th anniversary this year, Angloco supplies fire vehicles to over 50 countries. How are we supporting Bloodhound? 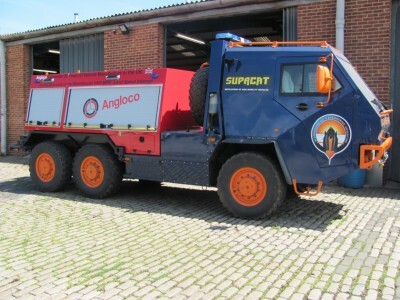 Angloco’s role is to provide all fire engineering and conversion for the two Supacat all-terrain vehicles and the two high speed Jaguar XJR fire and rescue cars. All fire and rescue equipment for the mission will be also provided by Angloco and they will provide the specialist training to operate these safely and effectively. This will also include the fully biodegradable firefighting foam “Moussol FF”. Bloodhound presents a particular challenge from a fire and rescue perspective with the combined fire risks of a combustion engine, jet and rocket engines (with the unique hazards of peroxide) and the extreme extrication and rescue issues of carbon fiber and titanium construction materials. Angloco will provide the specialist consultancy and support and is working with key partners to help overcome these should the worst happen.